In 1986, when Voyager swept past Uranus, the probe’s portraits of the planet were ‘notoriously bland,’ disappointing scientists, yielding few new details of the planet and its atmosphere, and giving it a reputation as a bore of the solar system. However, researchers today revealed new images that reveal the planet is actually home to torrid and bizarre weather patterns unseen on any other planet. Researchers used a new technique at the Keck Observatory to reveal in incredible detail the bizarre weather of the seventh planet from the sun. Uranus is the seventh planet from the Sun, and is named after the ancient Greek deity of the sky Uranus (Ancient Greek: Οὐρανός), the father of Cronus (Saturn) and grandfather of Zeus (Jupiter). Though it is visible to the naked eye like the five classical planets, it was never recognized as a planet by ancient observers because of its dimness and slow orbit. It is similar in composition to Neptune, and both are of different chemical composition than the larger gas giants, Jupiter and Saturn. Astronomers sometimes place them in a separate category called ‘ice giants’. Like the other giant planets, Uranus has a ring system, a magnetosphere, and numerous moons – but is unique because it is tilted sideways. The images reveal the planet’s deep blue-green atmosphere is thick with hydrogen, helium and methane, Uranus’s primary condensable gas. Winds blow mainly east to west at speeds up to 560 miles per hour, in spite of the small amounts of energy available to drive them. Researchers say the atmosphere is almost equal to Neptune’s as the coldest in our solar system with cloud-top temperatures in the minus 360-degree Fahrenheit range, cold enough to freeze methane. ‘My first reaction to these images was ‘wow’ and then my second reaction was WOW,’ says AURA’s Heidi Hammel, a co-investigator on the new observations and an expert on the atmospheres of the solar system’s outer planets. 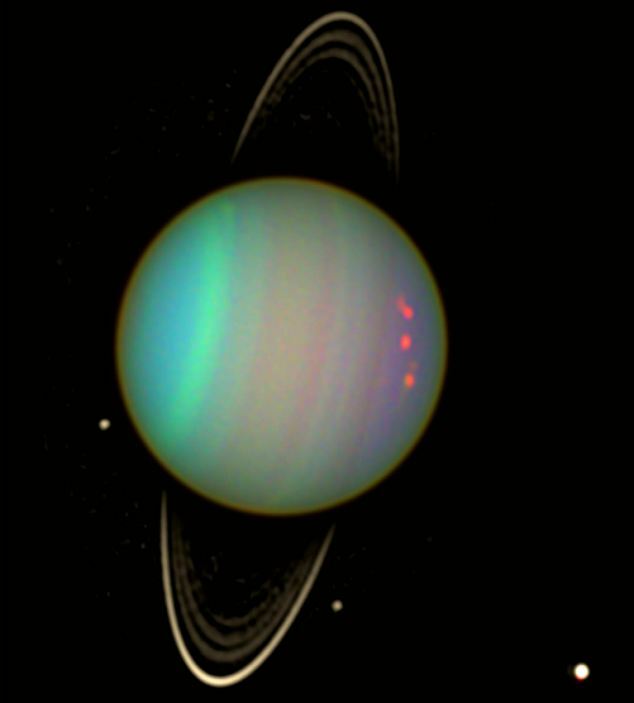 ‘These images reveal an astonishing amount of complexity in Uranus’s atmosphere. 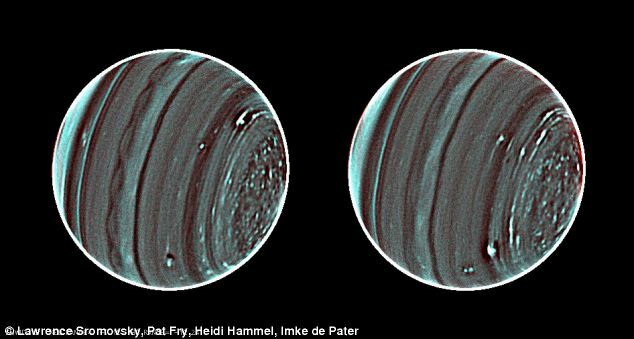 Large weather systems, which are probably much less violent than the storms we know on Earth, behave in bizarre ways on Uranus, said Larry Sromovsky, a University of Wisconsin-Madison planetary scientist who led the new study using the Keck II telescope. The scalloped band of clouds near the planet’s equator may indicate atmospheric instability or wind shear: ‘This is new and we don’t fully understand what it means. ‘We haven’t seen it anywhere else on Uranus,’ said Sromovsky. ‘Some of these weather systems stay at fixed latitudes and undergo large variations in activity. ‘Others are seen to drift toward the planet’s equator while undergoing great changes in size and shape. The team believe the primary driving mechanism for the strange weather must be solar energy because there is no detectable internal energy source. ‘But the sun is 900 times weaker there than on Earth because it is 30 times further from the sun, so you don’t have the same intensity of solar energy driving the system,’ said Sromovsky. ‘Thus the atmosphere of Uranus must operate as a very efficient machine with very little dissipation. Previous images of Uranus, such as this one taken in January 2004, failed to spot the weather conditions. The new Keck II pictures of the planet, according to Sromovsky, are the ‘most richly detailed views of Uranus yet obtained by any instrument on any observatory. The images were released in Renoat a meeting of the American Astronomical Society’s Division of Planetary Sciences. 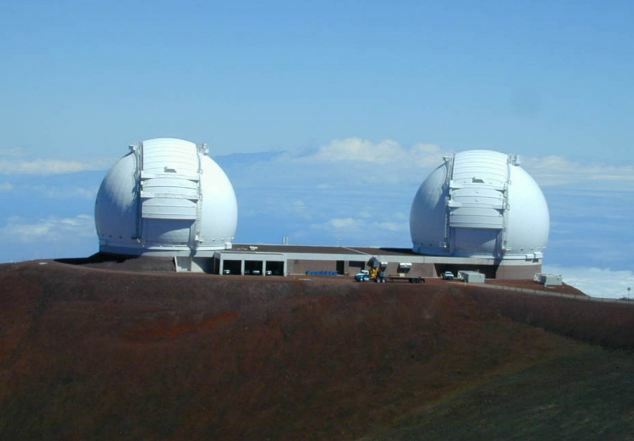 The team used used Keck II, located on the summit of Hawaii’s 14,000-foot extinct volcano Mauna Kea, to capture a series of images that, when combined, help increase the signal to noise ratio and thus tease out weather features that are otherwise obscured. In two nights of observing under superb conditions, Sromovsky’s group was able to obtain exposures of the planet that provide a clear view of the planet’s cloudy features, including several new to science. The group used two different filters in an effort to characterize cloud features at different altitudes. New features found by the Wisconsin group include a scalloped band of clouds just south of Uranus’s equator and a swarm of small convective features in the north polar regions of the planet, features that have never been seen in the southern polar regions. One possible explanation, is that methane is pushed north by an atmospheric conveyor belt toward the pole where it wells up to form the convective features observed by Sromovsky’s group. ‘Perhaps we will also see a vortex at Uranus’s pole when it comes into view,’ the researchers said. ‘Uranus is changing,’ he says. ‘We don’t expect things at the north pole to stay the way they are now.